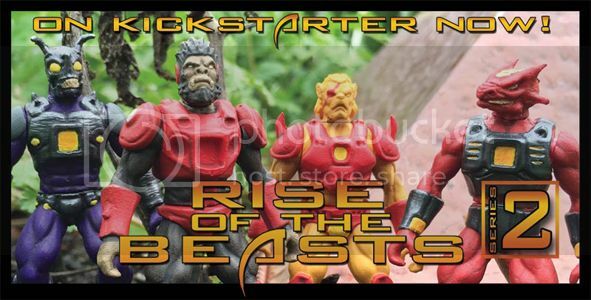 Rise of the Beasts Series 2 Kickstarter! Just a quick heads up that we have launched our Kickstarter for Series 2 of Rise of the Beasts! Thank you for everyone who supported Series 1 and who have picked up our figures over the last 14 months! Hopefully you are ready to add some fresh faces to your collection! LittleRubberGuys wrote: I'll post the link here once it is live! Definitely do so, because I want in on this, but have a terrible track record with remembering when the dates roll around. And are those the proposed "standard" colors in the picture above? Cappy wrote: And are those the proposed "standard" colors in the picture above? Once we get further along, I'll post up the first batch of alternate colors. Do you have an idea what the base plastic color will be? I guess the Kickstarter will explain it all. For the painted figures, the base color will always be the armor color. All the other bits are painted. For the lion and gorilla above, the pvc will be red. For the lizard and ant, the same metallic black we used on Gaamik and Cahriv. The unpainted figures will come in flesh and the two base colors above, as well as gold. But there will definitely be alternate colors too. For example, a blue armored lion and gorilla and a maroon armored ant and lizard, glow in the dark, etc. I love a FRESH FACE!! Never mind 4 of them! Kickstarter launches in less than 24 hours!! Otherwise, the new assortment are pretty cool. Well I'm officially broke... But I'll jump in before the deadline for sure! Just a reminder that KS won't actually charge your card until March 1st, when the project ends (assuming we reach our goal). So you can pledge today and not actualy have to pay for it until March. And if you get in a pinch before then, you can always modify your pledge at any time before the end date. I purposely timed the length to cover 3 pay periods (for those of us getting paid twice a month). I backed to get all the glow figure, plus the painted ones Plus a pair of blanks. I think I'll get two bone rhinos. One to keep as is and one to customize! Can anybody tell me if the Lion figure will have painted eyes in the final release or is that his final paint scheme? Hoping he has painted eyes. Loved the first two figures that I got, so I'm thinking I'll back this. Shiggy wrote: Can anybody tell me if the Lion figure will have painted eyes in the final release or is that his final paint scheme? Hoping he has painted eyes. Loved the first two figures that I got, so I'm thinking I'll back this. His eye is actually the same color as his hair. On that paint scheme, the skin is like a light lion yellow and his hair is like a standard yellow, so they don't contrast that much in pictures. But the eye is definitely painted a different color than the skin. Just a quick note on these, the armor is the PVC color and everything else is painted. Thanks for the response LRG! Glad to here they are painted. I guess the pictures were fooling me. I'll hopefully be able to back you before the day is up. I'm really psyched for the blue paint scheme on the Lion figure so I hope that shows up before to long. When I got home from D-Con my son saw wave 1 and stole mine. Shiggy wrote: Thanks for the response LRG! Glad to here they are painted. I guess the pictures were fooling me. I'll hopefully be able to back you before the day is up. I'm really psyched for the blue paint scheme on the Lion figure so I hope that shows up before to long. I am having that retouched. The white that is on the blue lion was a little too bright, so I have a buddy here who paints minis go over it with a slightly darker white. Com'on guys! Pitch in! It'll totally be worth it! New super cool stretch goals have been added! The amazing Rhinox & Scorponok Transformer homage recolors!! C'mon Glyos fans! Show the ROTB Series 2 Kickstarter some more love on Valentine's Day & pledge, so we can get the next 4 figures & Weapons pack made!